MORGAN CITY – To many, it might seem like quintessential Louisiana, but for people in this bayou community, it signals trouble ahead: an alligator trotting through a cemetery in town. Video of the small alligator walking through the Morgan City Cemetery was posted on Twitter overnight. The woman who recorded the video said she captured it Wednesday. See her POST HERE. The alligator is seen walking among the graves and majestic, old trees with moss hanging from them. There might not be any other more perfect image of a sleepy, old Louisiana town nestled in the swamp but the story behind the video isn't a simple, naive cliché – it's concerning. The alligator, the video poster said, is one of numerous that have started making their way into the community as water rises around levees in town. WBRZ has been reporting on backwater flooding far south of Baton Rouge between Assumption Parish and the Gulf for weeks. In some low-lying bayou communities, water has entered homes and businesses or is being kept out by sandbags. The cemetery is near Bayou Shaffer and between the bayou and railroad tracks that run through Morgan City. The Atchafalaya River in Morgan City was above flood stage Thursday and is expected to drop by next week, which should alleviate some of the backwater flooding issues. 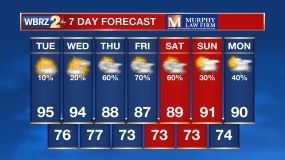 Click HERE for more forecast information.